With a band name like Gidgets Ga Ga and an equally off-the-wall album title, The Big Bong Fiasco, you might not expect to hear straightforward, classicist rock from this local trio, but that’s exactly what you'll hear on their new record. Describing themselves as sounding something like “The Replacements getting jumped by The Beatles and The Monkees, then molested by The Who and Nirvana,” Mick Flores (lead guitar and vocals), Zac Zidron (bass) and Larry Beers (drums) are all about catchy choruses, crunchy guitar riffs and DIY energy that owe equally to 60s garage rock and 70s power pop with a bit of 90s grunge thrown in for good measure. Just listen to opening track, “Beki” – which is the sort of song so instantly accessible that it remains firmly implanted in your head after only one listen – and you’ll get a good idea of the band’s mission statement. That cut might be the album’s strongest, but keep listening and you’ll find much more that's worthy of repeat plays. The galloping guitar and downright charming, Fab Four melody of “Dreamer” would appeal to any sucker for an old-fashioned, three-minute pop song, while “Streetwalker” rocks with abandon , “Belmont” has a smoky, grungey allure and “Hit by a Train” serves up an irresistible jangle. 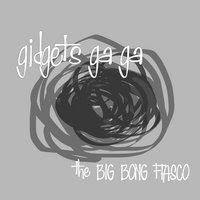 While many other bands on the scene seem fixed on chamber pop, alt-country and indie folk, The Big Bong Fiasco is solid proof that Gidgets Ga Ga are a band determined to keep the old school Midwestern power pop of bands such as Material Issue, Cheap Trick, Pezband and Shoes alive and well. The Big Bong Fiasco is available here.